Although literally nobody would mind if Applebee's brought back its insanely popular Dollaritas special for another month, it's officially October, and that means the casual restaurant chain's super-cheap drinks specials have to change with the leaves. Applebee's already covered Octoberfest with $2 beers last month, so now it's taking the logical next step and going full-blown Halloween with a new $1 zombie-themed cocktail. 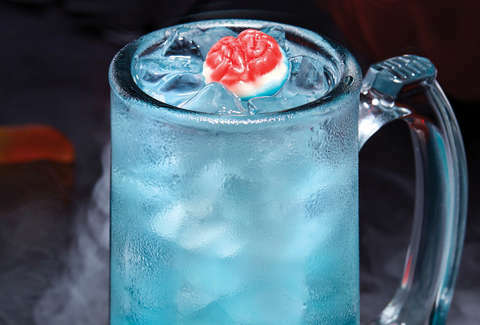 The bright blue beverage is aptly dubbed the Dollar Zombie, and it's available for a dollar all month long at your local Applebee's, the company announced Monday. The chain describes the spooky drink as "infectious," which would be kind of alarming if not for the clear zombie theme going on here. It's made with rum, passionfruit, pineapple, cherry, and lime. Oh, and each one is garnished with a brain gummy candy to add to the sweetness -- kind of like Halloween candy, but for adults. It's unclear if the zombie drinks are best enjoyed while in zombie costume, but hey, it probably couldn't hurt. You may want to call your neighborhood 'bee's before you show up demanding the cheap alcohol, though, since the deal may vary from location to location. "Halloween is a favorite holiday around here, and we're excited to offer guests the opportunity to celebrate all month long with our new DOLLAR ZOMBIE," Patrick Kirk, vice president of beverage innovation at Applebee's, said in a statement. "We invite people to get into the spirit early by trying our Neighborhood Drink with an infectious taste. The only thing to fear this Halloween is missing out on this awesome drink." All said, it's no margarita (that's a shame because National Taco Day is coming up), but if you're looking for a cheap drink with your dinner, well, this is your new option. Cheers to eating brains. Tony Merevick is Senior News Editor at Thrillist and would prefer his cocktails be strong over spooky. Send news tips to news@thrillist.com and follow him on Twitter @tonymerevick.